One of the oldest cities in the Americas, Cholula has a rich cultural history. Nonetheless it is a relatively small town that's easy to negociate by car or on foot, and easily accessed from Puebla or Mexico City. People come from far and wide to hike the lower slopes of Iztaccihual and other nearby volcanoes. Mountain climbers go for the top. Nice places to walk within the city and on the outskirts. You can walk from the town center to several lovely Indian churches just a few kilometers away. A few gallieries in town and at Container City; Cholula churches have some unusual icons and imagery. Most of the action is in San AndrÃ©s Cholula near the university campus. The small City Musuem has some worthwhile exhibits; there's also a museum at the archaeological site. The Great Pyramid of Tepanapa is one of the largest pyramids in the world. Within a few hours are the ruins at Tula, Teotihuacan, Cacaxtla, and Mexico City. 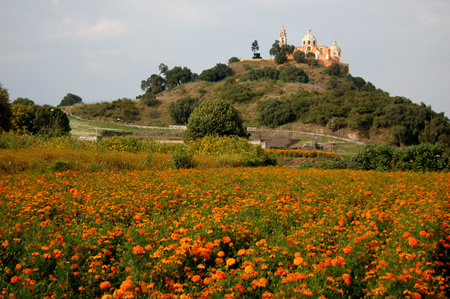 See churches, museums, and ruins in Cholula and nearby Puebla. Like Puebla, Cholula has Talavera pottery for sale. The Universidad de las America has football, soccer, and other sports teams. There are several interesting festivals each year featuring music and folkloric dances. Seated on a high plateau, Cholula is near some of the continents highest peaks, including Izta and Popo. A colonial town with many old churches and buildings, although the overall feel is not colonial. Close enough to Puebla to drive over for lunch! The climate is dry mainly. Cholula is a sweet and unpretentious town. Lots of young people are here for the University of the Americas. Mainly modest hotels with a few nice boutique hotels.